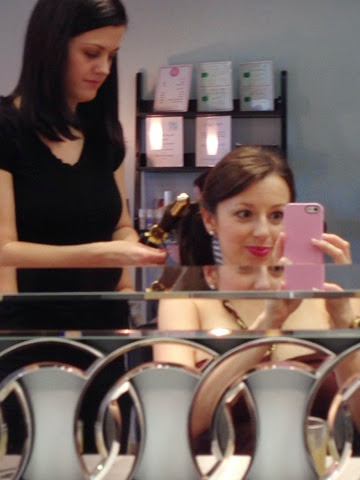 I'm a big believer in scheduling "me time," and when the opportunity arose to attend an updo tutorial event at Gorgeous Glo and Blo Out here in Charlotte, I quickly RSVPed yes. Little did I know that our baby would arrive nine days past her due date, making her only six days old on the evening of the event. To complicate things a little more, Ian had a work dinner to attend that evening. Here's where amazing moms come in to play! My mother, who was in town lending a helping hand with Camille, urged me to go out and assured me that all would be fine at the house. I fed the baby right before leaving the house and was back in time for her next feeding. 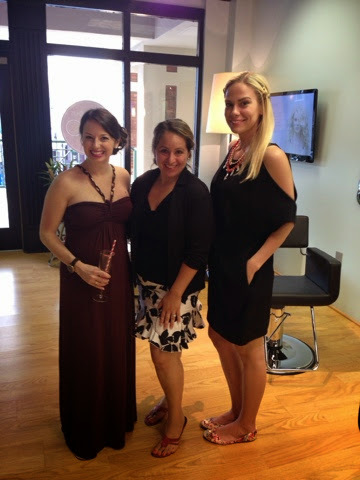 And within that two hour timeframe, I had the perfect girly evening! 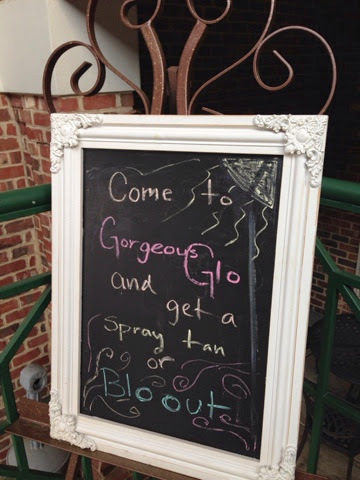 Gorgeous Glo specializes in hand-sprayed tans (hello contouring) and they even have a rapidly-developing version that would be perfect for a new mom like me that would need to shower after a few hours before nursing. 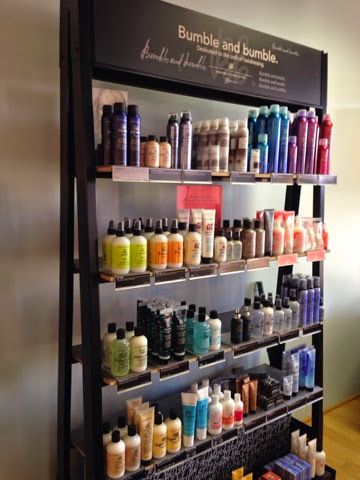 Blo Out is one of Charlotte's premier blow-out salons, and they feature Bumble & Bumble products. 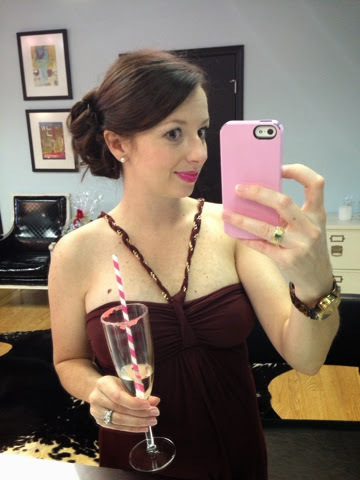 I've been here on a girls' night before, so I already knew their work was stellar, but I really looked forward to learning how to successfully create an updo for myself! 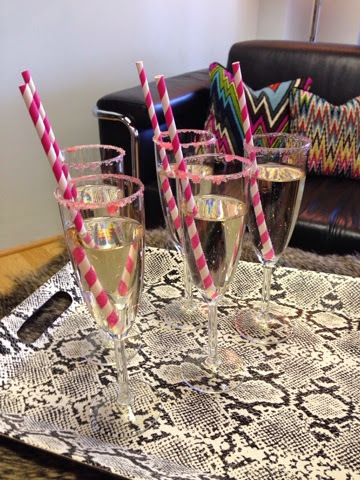 They really spoiled us at the event with pink-sugar rimmed glasses of prosecco and yummy bites. Here's what I was working with before -- straight hair, about 5-6 inches past my shoulders. 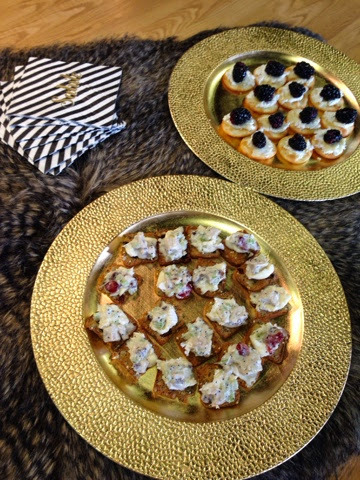 I styled it minimally that day in hopes that I'd be able to make it to the event! I requested a natural-looking low side bun with a lot of volume. The kind of style that could be an easy fix for second-day hair, but also the kind of style that would be awesome for a summertime wedding or outdoor event where you don't want to have the heat of your hair on your neck. 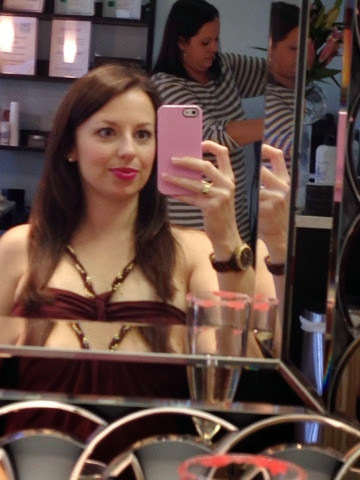 Want to know the secret that my stylist taught me? If you have thinner hair, like I do, you will want to create two separate ponytails, one on top of the other. There was maybe an inch gap between the two side ponies. Then, she curled the pieces of hair from each ponytail. 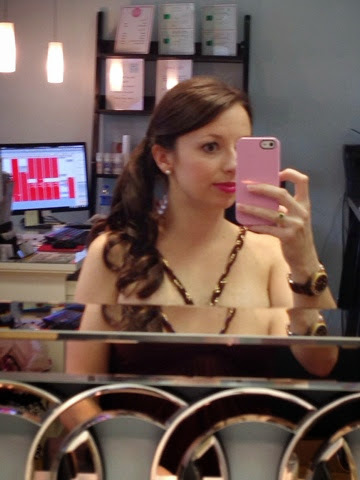 Once curled, she sprayed the curls for lasting power and also to give the bobby pins a little more grip. This is where you can just get creative and let the updo be as messy or as smooth as you'd like. She would slide the bobby pin onto the bottom inch of the curl, twist the curl in place, and then stick the pin (with the bottom piece of hair already in it) into the rest of my hair. This style took maybe ten minutes tops, and I LOVED the outcome! I would not hesitate to wear this style for a nice event or just for a summertime picnic. With it being so easy to recreate, I feel confident that it will be an easy summer style for me this year. I've recently fallen in love with the Bumble and Bumble Pret a Powder formula ($26 here -- and enter code FRESHROSE for a free Fresh Sugar Rose Tinted Lip Treatment SPF 15 With $25+ Purchase ... I've been dying to try that lip treatment!). This volumizing powder can just be shaken at the roots for instant lift and grip. 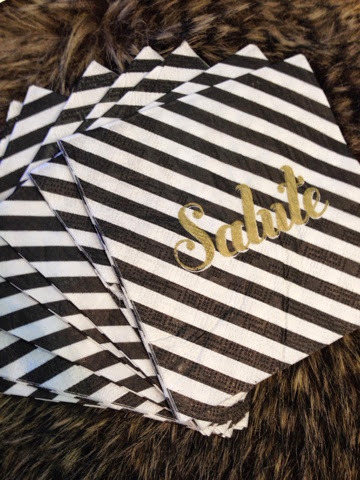 Also another wonder product for a new mama! 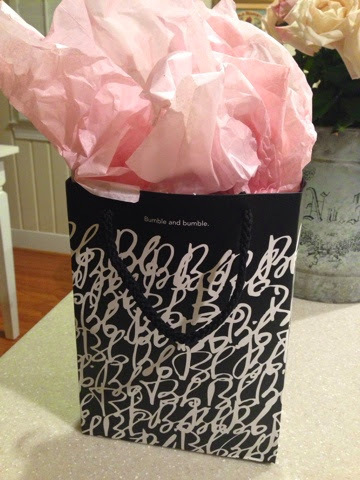 The hosts generously hooked us up with some amazing swag bags, although who are we kidding -- the very best part of my evening was having two hours of girly solo time ... and a glass of prosecco! 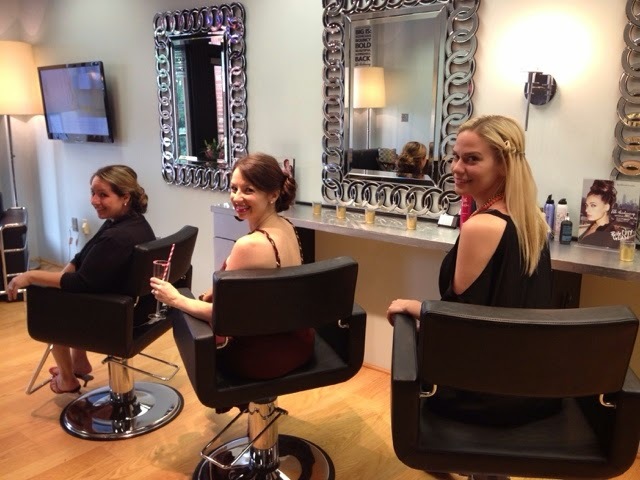 Gorgeous Glo and Blo Out have three locations in Charlotte, and you can even book an appointment online. Good for you for recognizing "me time". Happy Momma, happy baby! I think I'm going to have to give that updo a try this summer. Loving this! Glad you had a girls night - you deserved it, Mama! And the hair looks gorgeous:) Honestly, your hair always looks so thick and full, I had no idea it was on the thinner side. I have fine hair as well - what's your secret for lasting volume? You always have the best lift at your roots, and I have no idea how to do that! 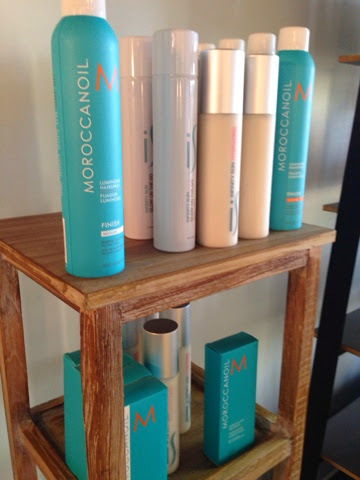 I'd LOVE to see a post on your current fave hair products/styling tools! Gorgeous! I love Bumble and Bumble products. Love the look!! I had a similar style for a wedding I was in last year. I'm so glad to know how to get the look a little faster and easier (a lot of the process was the same). Such a great summer and baby friendly style. Love it! So glad you got a few hours to yourself and enjoyed them! Your hair turned out great! I really need to learn some tricks for easy updo's. Prom hair for me was similar -- two ponytails, the smaller of which was wrapped around the larger to mostly get a big bunch of it out of the way. I've re-done it many times for sorority events and weddings - high, low, in between, it always works and it's easy to do! I had no idea bumble and bumble made that! I need that in my life ASAP! 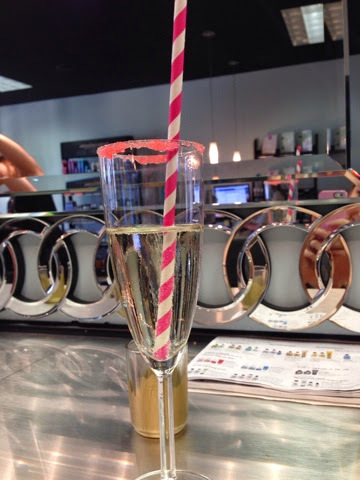 I wish my blo dry bar hosted tutorial nights like this!!! Love how your hair turned out, and I have to say you look so amazing! I am glad you are making some time for yourself. I go to that place and LOVE getting my hair blown out!! I should have gone that night!!! Good for you! Love the side up-do and I have to say, six days post baby and you are looking quite lovely!